ARI Network Services (ARIS) provides electronic parts catalog and website solutions for businesses in the Automotive Tire & Wheel, Powersports, Outdoor Power Equipment, Durable Medical Equipment, Marine, RV and White Goods industries. I believe ARIS is worth between $6.57 and $12.31 per share based on comparable EBITDA and Revenue multiples for gains of between 123% and 319% once the market recognizes the value of its business model. Significant merger and acquisition activity in the software as a service (“SaaS”) and data as a service (“DaaS”) space supports this viewpoint. ARIS provides SaaS and DaaS solutions to help equipment manufacturers, distributors and dealers in certain verticals. ARIS is a provider of electronic catalogs, data and websites to its customers. ARIS’s business has over 90% recurring revenue, 80% gross margins and 22,000 customers. Its client base consists of dealers, distributors and manufacturers across a number of industries with no significant customer concentrations. Its main office and headquarters is in Milwaukee, WI, with other important offices in Duluth, MN, Cyprus, CA and the Netherlands. ARIS is led by CEO Roy Olivier. Prior to ARIS, Mr. Olivier founded Media Solutions International, which, similarly to ARIS, provided electronic catalogs and was sold to ProQuest Business Solutions in June of 2000. ProQuest was eventually sold to Snap-on Business Solutions (SNA) in 2006 for $527m. SNA is a competitor to ARIS in the eCatalog business within the Powersports segment. Mr. Oliver has a significant stake in ARIS with greater than 720,000 shares, which accounts for over 5% ownership of the company. After growing the eCatalog business, ARIS began using the natural synergies and advantages of having an eCatalog as well as its relationships with dealers, manufacturers and distributors to help provide websites for these same customers. ARIS obtained the original platform for the websites it develops in January of 2007 when it acquired OC-Net, Inc. ARIS’s website business consisted of $4.7m in revenues in its fiscal year ending July 31, 2012, however, after two large acquisitions made soon after, websites now make up greater than $16m and over 50% of its revenues. The first of these two acquisitions that ARIS made was Ready2Ride in August of 2012. Ready2Ride was the leading and first-to-market provider of aftermarket fitment data to the Powersports industry. This acquisition allowed ARIS to differentiate its content from its competitors by providing aftermarket data that others do not provide. The second acquisition was purchasing the assets of 50 Below out of bankruptcy in November of 2012. This purchase more than doubled the size of ARIS’s website business and made websites the Company’s largest source of revenue. 50 Below gave ARIS a presence in the Wheel & Tire and Durable Medical Equipment verticals, which ARIS did not participate in previously. When 50 Below was in the bankruptcy process, the two companies that were bidding for the assets were ARIS and Dominion Enterprises (http://www.dominionenterprises.com/company/). Dominion competes with ARIS in the websites business. Interestingly, ARIS won the bid over Dominion even though it offered less monetarily for 50 Below. It outmaneuvered Dominion by hiring local legal representation, promising to drop an IP claim against 50 Below, assuring the trustee that ARIS will keep 50 Below’s Duluth operations and by the active participation by ARIS’s senior management in the court proceedings. In the quarter ending in January of this year, ARIS was able to reduce headcount from further integration of its 50 Below acquisition, which represents an annual savings of approximately $2.5m. The results from the quarter ending in April showed the benefits and the increased EBITDA from the efficiencies. ARIS’s business consists mainly of two parts that go hand in hand: the eCatalog and the website. The eCatalog business provides subscriptions for publishing and viewing whole goods, parts, and service reference information pertaining to equipment. This allows multi-line dealers to quickly access data for any of the brands serviced from the ARIS software, allowing dealers to more quickly service and sell to their customers. The collection of data from various OEM and after-market manufacturers, over many years and in different formats and descriptions, makes obtaining all of the data and enriching it for dealers and customers a strong barrier to entry for competitors. Not only is this is a labor intensive process upfront, but manufacturers are also hesitant and unlikely to pass along such information to an unestablished company that does not already have strong relationships with authorized dealers. The enrichment of the data is critical to the sales process of multi-line dealers. Each manufacturer describes their products differently and it is ARIS’s responsibility to make sure that every part from each manufacturer can relate to one another. To explain this, I’ll use a simple example. Let’s say you are looking for a red motorcycle helmet. On the surface it seems like it would be simple to look up all motorcycle helmets that are red, but in reality this process is much more difficult because manufacturers may call what seems to be a red helmet, maroon, ruby or some other version of the color red. ARIS’s data enrichment team takes this data and codes it so that any shade of red will show up when a customer or service technician searches for the color red. I used the color red as a simple example, but the same is done for more complex situations like sizes (different manufacturers can use different names and measurements for sizing), or parts compatibility with specific models. 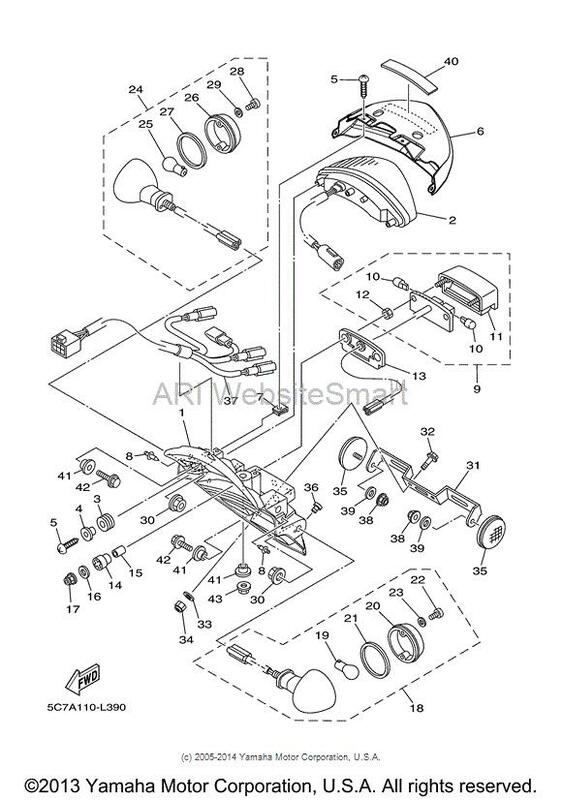 ARIS does the work so that the dealers or consumers can look up, for instance, all of the OEM and aftermarket versions of handlebars that will fit onto a particular 2009 Honda (HMC) motorcycle. eCatalogs are also used by service departments to do quick and easy parts lookups. Instead of having to manually search each manufacturer’s catalog and find the corresponding part, an eCatalog allows it all to be searched electronically, which speeds up the process, saving the service department valuable time and improving customer service. ARIS can also provide aftermarket fitment data as well as OEM, which creates value by potentially giving the customer and dealer more options when it comes to choosing a replacement part. Getting access to such information and enriching the data so that it can be used effectively creates a strong barrier to entry. One company, Bridgeline Digital (BLIN) attempted to license content to create a catalog for the motorcycle segment, but since they lacked a dealer install base, many manufacturers would not supply them with the data to create a multi-line parts and product catalog. The main competitor that ARIS faces in the eCatalog segment is Snap-on Business Solutions (SNA). Digital catalogs are a tiny business for SNA and the only vertical that it competes directly with ARIS in is the Powersports segment. SNA’s main focus with eCatalogs is on the automotive segment, with most of its energy on Chevy, Ford and Chrysler applications. While the eCatalog business is a stable, slow growth business for ARIS with over 18,000 subscribers generating just under 50% of ARIS’s revenue, the content is tightly integrated and drives the fast-growing website business. The average revenue that ARIS collects per dealer for eCatalogs is approximately $100 per month. There are many cheap and easy ways to make a website. You can find public companies such as Wix.com (WIX) or Web.com (WWWW) where you can build your own site for $30 per month or less. There is also Weebly, which I use for my business, which even has a free option (would you expect anything less from a value investor?). Another option is to have a web developer create a custom site for a fee ranging from a few hundred to a few thousand dollars and have it hosted for as low as $10 to $20 per month. Comparatively, ARIS’s average revenue per dealer from a website is $275 per month. ARIS does not compete in the low end business card types of websites. It creates fully functional, vertical specific, ecommerce stores typically for dealers that carry multiple brands. Using fitment data from the eCatalogs created by ARIS, these ecommerce stores create user interfaces that are easy and intuitive for the customers to access products and inventory from dealers and distributors. These websites connect with external accounting, inventory and order management software that allow for automated real time updates throughout the customers’ business. In total, ARIS has 90 partners like ADP Lightspeed, Epicor and ZiiOS that it integrates with. When it comes to the economics of being a vehicle dealer, the most profitable part of the business is typically the service department. Similar to the auto business, these dealers make lower margins on selling whole goods, such as cars/boats/motorcycles/etc. The gross margin for these goods are in the single digits. When it comes to the service aspect of the business, the highest margin is in labor, followed by parts, which is usually between 30 to 40%. The service aspect is critical to dealership profitability and was highlighted during the recent “great” recession, where many of the dealers that focused on whole goods went out of business. The data provided by the eCatalog portion of the business as well as relationships with OEM’s and aftermarket parts manufacturers allows ARIS to power the parts side of the dealers business like no other website company. Competitors in the website part of ARIS’s business vary by industry vertical. 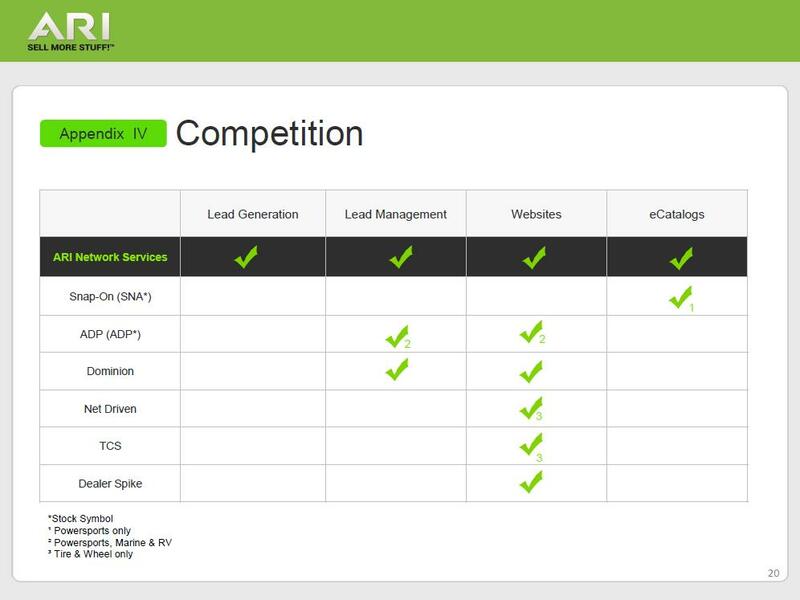 Below is a slide from ARIS’s investor presentation showing the competition and footnoting the different verticals that they compete in. The vertical where ARIS has the most website customers, Wheel & Tire, also has a good number of competitors. ARIS lists TCS and Net Driven in the slide, but there are other companies such as ASA Automotive Systems and EZY Tire. Compared to the other verticals that ARIS competes in, this market has the most competition, but it is also the largest market with 18,000 dealers in the US. The broader automotive market has nearly 80,000 dealers, which is more than all of ARIS’s other markets combined. Despite the competition, ARIS’s CEO mentioned in the last conference call that the automotive wheel and tire segment continued to post strong double digit growth compared to the previous year. In general, once a Wheel & Tire website is setup by ARIS, it becomes “sticky” as the website gets integrated into the dealers scheduling and quote request system. Also, ARIS automatically connects to OEM’s and displays updated promotions and marketing materials for display on the website. Unless a dealer has a problem with its website, it is not likely to spend the time and money to change providers and setup a new site. A neat new feature exclusive to ARIS allows the ability for dealers to provide side by side wheel on vehicle comparison, which makes the choice clear for the customer as to which wheel looks best that fits their vehicle. This can be shown either online or in-store. The next largest vertical for ARIS is Powersports. Powersports consists of motorcycles, ATV’s, Snow-mobiles, and personal watercraft. There are 2 other competitors in this vertical: Dominion and Dealer Spike. Both Dealer Spike and ARIS have been aggressively converting dealers that were previously using Dominion. Dealer Spike’s strength is in pushing customers towards Whole Goods, while ARIS has a stronger focus on Parts & Accessories. I talked earlier about dealer economics in selling Whole Goods versus Parts & Accessories within the eCatalog section, and the dealer economics for Parts & Accessories is usually what helps drive dealer websites to ARIS. ARIS provides parts lookup and user interface that not only features more parts, but also makes it simpler for the customer to choose the part that they are looking for. In addition, ARIS’s most recent update to its website platform allows it to provide sites for dealers that can focus on selling whole goods with designs and functionality similar to Dealer Spike. Dealer Spike does seem to be a formidable competitor to ARIS’s websites in this vertical. Dealer Spike provides a solid website that is usually designed well. However, Dealer Spike does have a $1,500 setup fee and charges $399 per month for the lowest package, before charging for optional add-ons. This compares to ARIS which does not typically charge a setup fee and charges on average $275 per month. From speaking with dealers who have had websites from both companies, Dealer Spike seems to fit well for dealers who know exactly how they want a site to be laid out and has Dealer Spike do the work for them, while ARIS customers believe that websites should have similar functionality compared to those of other e-commerce platforms that customers are already used to. I don’t think that the two companies are really poaching many customers away from each other, as ARIS has only lost approximately 18 of its website customers to Dealer Spike over the past 12 months, out of a total of ARIS’s 3,200 website customers in the verticals in which they overlap. Dominion, which has a subsidiary called Power Sports Network, seems to be losing website market share to the others. Representatives from Dealer Spike and dealers that I’ve spoken with have mentioned that Dominion has not focused much effort on improving its sites and the support that they provide for them. Dealer Spike claimed to be converting over 50 sites a month from Dominion. Also, ARIS and Dominion were the two companies trying to buy 50 Below out of bankruptcy and ARIS was able to win the bid and outmaneuver Dominion, despite offering a smaller amount, as I mentioned earlier. Despite having these two competitors in Powersports, this vertical is ARIS’s second fastest growing website segment. This oligopoly is allowing for rational competition and creating the opportunity to create sustainably high margins. I believe that there are high barriers to enter this market, as one must have strong relationships with the manufacturers and dealers in addition to understanding the internet, e-commerce and digital marketing. At the end of the day, manufacturers want to have close relationships to the companies that they supply their data and information to make sure the end user has a good result utilizing it. The two remaining parts of ARIS’s business consist of Lead Management and Digital Marketing. Currently they make up about 4% of revenues. The Lead Management SaaS that ARIS provides, called FootSteps, provides a system to efficiently manage and nurture leads. The more exciting part of these two business segments is digital marketing. In November 2013, ARIS acquired DUO Web solutions, a leading provider of social media and online marketing services in the Powersports industry. This was mainly a talent acquisition to bring on Heather Blessington, who is now Chief Marketing officer, and her team. The digital world is not like the movie Field of Dreams, where “If you build it, they will come”. It may have worked for Kevin Costner’s character, but with websites it does not quite work that way. The web is such a crowded place that almost no one will come to a website unless it is properly marketed. Digital marketing can be broken down into 4 pillars: Search Engine Marketing, Online Reputation Management, Social Media, and Email/Text-Message Marketing. Dealers in ARIS’s verticals focus on engaging their customers in a way that creates trust and demonstrates reliability. ARIS’s digital marketing team can help dealers achieve these things. Dealers can engage on Twitter (TWTR) and Facebook (FB) about events happening, write blog posts about industry news customers find interesting, or a multitude of other things to build and maintain customer engagement. Digital marketing has become so important that OEM’s are starting to re-allocate some portion of their traditional local advertising reimbursements, like Radio, TV and print ads, to digital marketing. Ask any successful website owner and they will tell you that marketing is an extremely important aspect for its success and can be costly. Digital marketing allows consumer response to be measured accurately, unlike Radio, TV and print ads. A dealer can measure how many people click on a link, how long a visitor stays on their site, what type of device or browser they are using, and many more metrics, including return on investment. ARIS’s digital marketing offering includes all of the above segments except for the 10.3% website portion and the 7.4% video production portion. That leaves a total of 82.3% of the digital marketing budget to potentially be spent with ARIS by its customers. That is approximately 8 times what is currently spent by customers on the website business. Gartner only asked companies over $500m in annual revenues to participate in this survey, which may apply differently to ARIS’s dealers. Let’s look at another survey, which was instead done by asking small businesses about their digital marketing spend. According to a report by media research firm Borrell Associates, small and medium sized businesses spend approximately $17,000 annually on web marketing services. About 50% is spent on website maintenance and design, while around 35% is spent on online public relations, marketing support, and consulting. Small businesses do not have the resources of larger businesses to spend as much on marketing compared to fixed costs like website design and maintenance, so the second report from Borrell Associates makes sense. ARIS’s customers spend an average of $3,300 per year for a website. 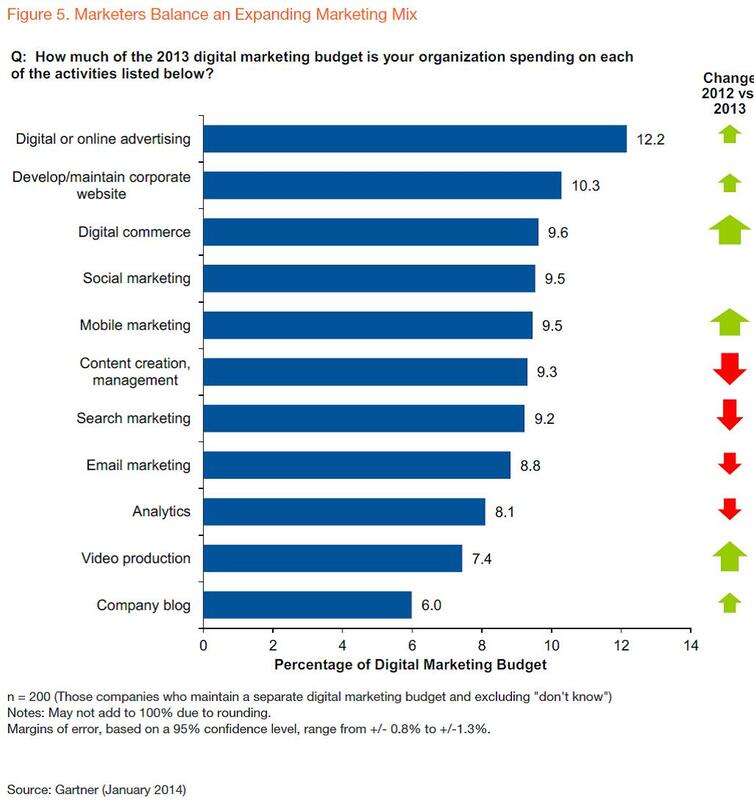 If they have a similar ratio for digital marketing to that of the report, they would spend on average $2,310 per year. ARIS has over 5,500 website customers, which would come out to $12.7m in digital marketing revenue if the customers spent an average of $2,310 per year. Assuming a 60% gross margin for this business and a 30% incremental EBITDA margin, ARIS could obtain $7.6m and $3.8m in additional gross margin and EBITDA respectively within the next few years. I have not included any of these possibilities in my financial models and any growth in this area I consider to be additional upside. If I give the $3.8m of EBITDA ARIS’s current 11x multiple, this business alone would add $3.09 to the current share price. The digital marketing products that ARIS launched range from $250 to $1,000 per month, which on the lower end is a very close match to the research study that I referenced to earlier. It seems from the last call that the CEO is optimistic about where this part of the business is heading. 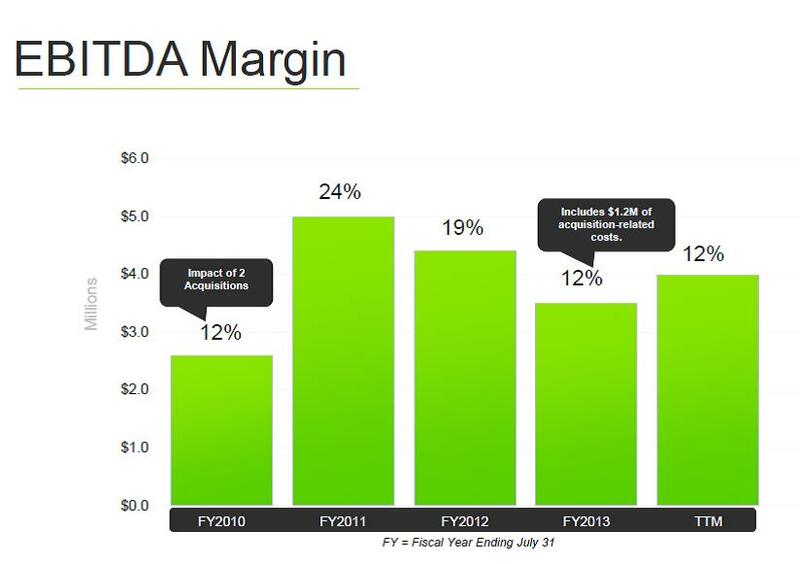 For the two years prior to ARIS’s acquisition of 50 Below, ARIS’s EBITDA margin was 24% in fiscal 2011 and 19% in fiscal 2012, as seen in the chart below. 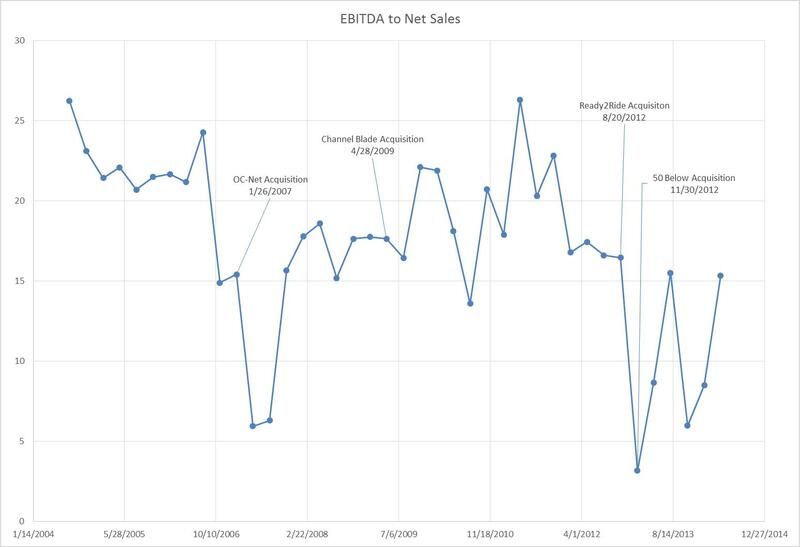 I made another chart below showing the EBITDA margin quarterly which more drastically shows the impacts on margin after acquisitions in addition to historical margins. 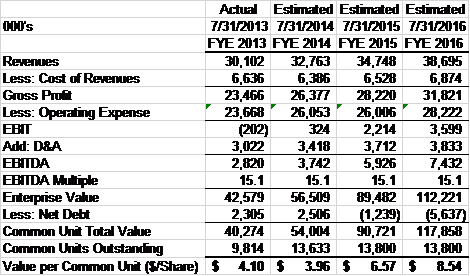 From the chart above, you can see that after making acquisitions, ARIS’s EBITDA margin drops quite considerably. This is usually due to one-time acquisition, duplicative overhead and restructuring related expenses. After taking restructuring expenses by reducing headcount in Q1 and Q2 of this year, ARIS expects to save $2.5m on an annualized basis. The most recent quarterly results started to show this improvement with EBITDA margins over 15% and management’s comments indicating that they expect to head back to more normalized levels of around 20%. ARIS has two main business segments, eCatalog and Websites. eCatalog is the slow growing cash cow that helps drive and fund the fast growing website business. It also provides the data for website owners’ that makes the relationship quite sticky. Recently ARIS announced that it had signed an agreement to provide eCatalog software for Kioti dealers in France. “Like in this case the KIOTI France we're putting a solution on their distributor site for B 2 B e-commerce between them and their 160 dealers in France. Assuming that ARIS can get just 500 websites from KIOTI Europe dealers after integrating the content, at $300 per website per month, it would add $1.8m annually in incremental recurring revenue. At the end of the day, content is king. It is what drives ARIS’s business as well as creates the barriers to entry from competition. To grow the website business by around 20%, ARIS would need to add approximately 1,100 customers in year one and 1,300 customers in year two from its current base of approximately 5,500 website customers. Although this may seem like a tall order, ARIS has multiple verticals to drive growth in this business. ARIS is one of the first movers in the Home Medical Equipment vertical and recently announced an agreement in April 2014 with a leading distributor to be the exclusive provider of websites to more than 8,000 of their service providers. If ARIS can provide websites for 30% of these dealers within two years, then they will have hit the 20% growth rate for websites from this vertical alone. ARIS acquired the Home Medical Equipment website business when it purchased 50 Below. 50 Below had entered the business, but was having difficulty investing much into it as it was going bankrupt. ARIS is getting strong response from Home Medical Equipment trade shows and this is its fastest growing vertical. There have been some new rules created within Medicare for the bidding process for suppliers in Home Medical Equipment. This is driving suppliers to push more local dealers to increase their online presence to meet the demand created by the rule making. ARIS is one of the first-movers in this space and it sets the Company up to have a strong position within this vertical. ARIS estimates that the number of dealers for Home Medical Equipment in the US is approximately 25,000. The Powersports segment continues to be strong for ARIS as well. In the most recent conference call, the CEO mentioned that it is the second fastest growing market behind Home Medical Equipment. This industry may seem saturated, but the websites that run on Dominion’s platform are very antiquated and have been providing ARIS with a strong opportunity to pick up market share. Wheel and Tire is another segment that is growing quickly for ARIS. ARIS said that it has had double-digit sales growth since last year in this vertical where they have 2,150 website customers with a total market of 18,000 dealers in the US. International sales is an area where ARIS has room to grow as well. Currently ARIS provides content for between 2 to 4 brands in Europe depending on the vertical. They are continuously working on getting deals for content with more brands, similar to the deal they made with KIOTI France. This should be another avenue for ARIS to grow in. Recently, ARIS moved the old 50 Below operations in Duluth from what one employee on Glassdoor.com commented: “Still in the dumpy old buildings but ARI has a plan in place to get us into a nice office building in the very near future.” ARIS finally moved into its new Duluth facility in 2014 which has space for 180 employees. Currently the Duluth operations staff 125 employees. I view this as a positive sign that the company expects things to go well in addition to better productivity from employees since they are working now in a better environment. One way that we can value ARIS is to find comparable publicly traded companies and see what multiples they are trading at to get a fair multiple to apply to ARIS. I chose DealerTrack (TRAK) and Veeva Systems (VEEV) because they are vertically focused SaaS providers, similar to ARIS. ChannelAdvisor (ECOM) is very similar to ARIS in that they provide websites for customers and a full solution that can integrate with a storefront or multiple other sales channels. ECOM is not specific to any particular vertical. Web.com Group (WWWW) and Wix.com (WIX) provide simple to use website platforms on a recurring basis not specific to any verticals. Digital River (DRIV) provides full e-commerce platform solutions to companies, just like ARIS, except specifically for digital products and cloud service companies. Bridgeline (BLIN) is a web development and services company that is similar to ARIS website business, but not focused on specific verticals and does not have the eCatalog side to drive the website business. BLIN also has only around 25% of its revenue as recurring, as compared to the 90% with ARIS. 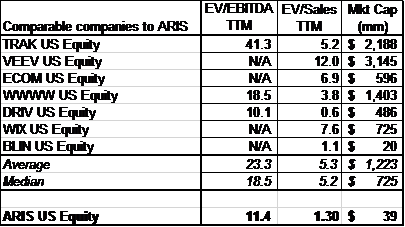 Based off of the comparable companies in the chart above, I think it would be fair to value ARIS at the median EBITDA or Revenue multiples of 18.5 or 5.2 respectively. From discussions that I have had with various software bankers, they reaffirmed that such a valuation is reasonable for ARIS. 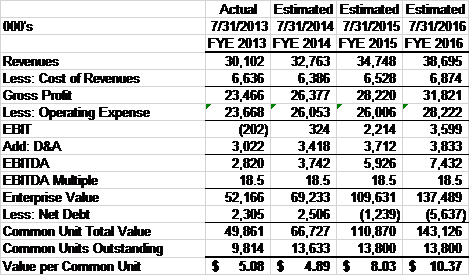 Below is a table showing my financial estimates for ARIS’s fiscal years 2014 through 2016, which ends on July 31st. The only estimate for fiscal year 2014 is the July quarter. If I apply the comparable median 18.5x EBITDA multiple to my ARIS EBITDA estimate for the year ending 7/31/2015, I get a share price of $8.03. Most of the EBITDA growth compared to FYE 2014 comes from the $2.5 million in annual expenses they saved from the restructuring they did at the end of Q2 in fiscal 2014. If I look at my estimates for FYE 2014 EBITDA, since the fiscal year ends any day now, and add back approximately half a year of restructuring savings, EBITDA would be approximately $5m over the past 12 months, which would value ARIS at $6.60 per share today when giving it an 18.5x EBITDA multiple. If I apply the comparable median 5.2x Revenue multiple to ARIS, I get a share price of $12.31 with my projections out one quarter, for the year ending 7/31/2014. I kept nearly everything flat in my fourth quarter projections, with any increase in EBITDA coming again from the expenses that were cut out from restructuring in the 2nd quarter. The last sentence is where an acquisition of ARIS would provide additional value to a marketplace such as eBay or Amazon. Not only could a company like eBay stop ARIS’s dealers from sending data to other marketplaces, but it could also take away a strong source of fitment data that could be used by competitors such as Amazon as well, with a potential acquisition. Both eBay and Amazon license ARIS’s data for use in their marketplaces. eBay seems to have recently been interested in the verticals that ARIS is in. Just 3 months after acquiring WHI, eBay announced in May of 2012 that it was launching parts compatibility in the motorcycle parts & accessories categories. This info is provided by ARIS, as they are the only company to provide aftermarket data for parts & accessories within the Powersports vertical, which includes motorcycles. According to discussions I have had with various software bankers, companies such as eBay, Amazon and Oracle pay 5 to 10 times revenues for companies like ARIS. One hindrance to ARIS receiving a full multiple is its current trading multiple. Acquirers do not like to pay large premiums to current trading prices. If ARIS gets larger and moves closer to what I believe to be its fair value, an acquirer could pay a multiple closer to full value. Many of the deals in this industry are private and the terms are not disclosed, such as the WHI Solutions acquisition by eBay. This allows companies to pay high multiples for acquisitions without investor and other public scrutiny, like we have seen with Facebook’s acquisition of Whatsapp. What I have heard from software bankers anecdotally reaffirms the multiples that I used when looking at comparable public companies to ARIS. In addition, the Software Equity Group is an investment bank that releases a monthly report of the financial and valuation of publicly traded SaaS companies that can be used as benchmarks for merger and acquisition deals. In the June 2014 report, for vertically focused SaaS companies, they had a median EV to Revenue multiple of 7.2x and a median EV to EBITDA multiple of 50.8x. The report shows a median EV to Forward Revenue of 5.8x and a median EV to Forward EBITDA multiple of 15.1x. If I apply the forward EBITDA multiple of 15.1x to my projections for ARIS’s year ending 7/31/2015 EBITDA, which is about 12 months from now, I get a share price of $6.57/share. If I look out two years and apply the same multiple, my valuation for ARIS becomes $8.54/share. If instead of EBITDA, I use the forward median revenue multiple of 5.8x my estimated FYE 2015 revenues, I get a valuation of $14.69/share for ARIS. Keep in mind that all of my financial projections are based off of almost non-existent growth in the digital marketing component of ARIS business, 10% website revenue growth in FYE 2015, and flat eCatalog revenue in FYE 2015 as well. Another way to look at ARIS’s business is to value its two main segments based on their characteristics. The eCatalog division is a steady business that has historically generated nice cash flow, and the Websites division is the fast growing side of the business with a big ramp. I think it would be fair to give an EBITDA multiple to the eCatalog business and a Revenue multiple to the website business. To breakout the EBITDA from the eCatalog business, I am going to consider it to be a $13.2m a year business, with a 24% EBITDA margin, which comes out to $3.2m of EBITDA. For a business that is over 90% recurring revenue with little to no capital expenditures, I think it would warrant at least a 10 times EBITDA multiple. This would give the business an EV of $32m. Now to value the website business, which management expects to grow at 20%, currently has revenues of $16m annually. If we apply a revenue multiple of 5x to this part of the business, we get an EV of $80m for the website portion. Combining both businesses together gets a total EV of $112m. If I subtract $2.5m for net debt, and divide by the 13.8m fully diluted shares outstanding, ARIS is valued at $7.93/share, as of today. Based off of nearly all metrics of valuating SaaS companies, ARIS should be trading at levels ranging from $6.57 to $12.31 within twelve to fifteen months. Once it reaches such valuation measures, ARIS could very well begin to shop itself and would be very beneficial to another SaaS company as an acquisition. Roy Olivier, ARIS’s current CEO has sold a company in the past, and I would not be surprised if he would sell this company as well once he has grown both the company and its valuation has increased to where it would not receive a discounted buyout offer due to its current low market valuation multiples. If you back out the restructuring expenses and annualize the savings historically for FY 2014, ARIS is currently trading at 8.6 times EBITDA, which is unusually inexpensive for a SaaS company with over 90% recurring revenue. If ARIS wanted to, it could cut down on its sales & marketing expense and turn the company into a cash generating machine, but with the eCatalog business providing value to the website side of the business, and opportunities to grow the website portion of the business profitably as well, it is wise to grow the business in such a manner. Reduction in headcount and restructuring expenses should bring EBITDA margins back to normalized levels. Growth in Home Medical Equipment vertical from dealers needing to find new revenue sources after Medicare reimbursement cuts of nearly 50%. New products, including digital marketing can drive revenue and cash flow. This business seems ok, but far from great. That said, the assumptions you have used to arrive at your valuation are not even close to realistic for a company with a growth profile as slow as you portray here. You either need to figure out how this thing can grow or dramatically reduce your multiple estimates. My guess is fair value is sub-$5. I understand your trepidation on the multiples. The two bankers I spoke with said that the ecatalog business has value to a strategic buyer like Amazon or Ebay. It is a slow growth part of the business, but in the hands of buyers like that it locks out competition and is worth quite a bit more than other slow growth internet vehicles. I agree with you that to get the higher multiple the business needs to be growing more quickly at the expense of current cash flow. Having visited the Company, I believe that the verticals that they are in offer the opportunity to grow more quickly especially when combined with their internet marketing offering. True Wind Capital is paying a nice premium to where the stock was trading before its big run up the last few weeks. I believe this is a fair price, though I would have preferred an industry buyer to pay more. Are you sure you want to close this position ARI NETWORK SERVICES INC? Are you sure you want to Flag this idea ARI NETWORK SERVICES INC for removal?